These are custom drivers build in-house by Steve's LEDs. They were designed from the ground up to be used for LED lighting applications for marine and freshwater aquariums. They offer a terrific amount of features that rival every other brand of LED driver on the market. NO SOLDERING REQUIRED. 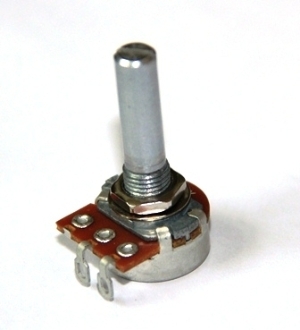 We use a high quality 'wire-bite style' connector. They do not include the required power supply, because if one part of the driver is damaged, the whole unit is rendered useless. 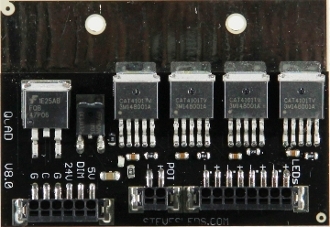 With Steve's LEDs drivers, if you have a problem with one component, only that single component needs to be replaced. Furthermore, these drivers are modular. Secondly, with the dual powersupply/driver unit, you cannot tune them for maximum efficiency, you rarely achieve maximum efficiency out of the box. With Steve's LEDs drivers, 97% efficiency is easily attainable! The Quad Dimming LED Driver was designed to run FOUR entire arrays of LEDs each with a combined forward voltage up to 25V and each at 1,000ma. The item you receive may not look identical to the picture due to continuous improvements to our products. Steve's LEDs, LLC is not responsible for accidental errors, omissions, and mistakes anywhere on this webite. Absolutely the best for the buck! I buy Steve's quad drivers on a regular basis, and the quality of both the drivers and the service can't be beat! -Lifespan - Every component that the driver is built with is rated for a minimum of 200,000 hours, or 23.5 years of continuous usage 24 hours per day. -To Obtain Max Efficiency - You must use an adjustable voltage power supply to obtain maximum efficiency and to guarantee that the driver is outputting the specified current rating. -Dimming - YES, it comes with a FREE remotely mountable dimmer knob! -Available versions- 350ma, 700ma, 1000ma. --Operating Frequency of the driver - 5 MHz! One of the fastest driver chips on the market! ZERO flickering when dimming! -Arduino input - YES. This is plug and play with Arduino, and even works with stock Arduino programs! -PWM Input - YES. This accepts standard PWM for dimming and automation. Accurate linear dimming is compatible with PWM frequencies from 100 Hz to 5 kHz for PWM duty cycle down to 1%. PWM frequencies up to 50 kHz can be supported for duty cycles greater than 10%. -Aquarium controller compatibility - YES! Any aquarium controller with 0-10V dimming can control this driver using Steve's Aquarium Controller Harness. For this driver to accept a 0-10V input, Steve's Aquarium Controller Harness is required. - 3 year limited warranty agains manufacturing defects. Steve's LEDs, LLC will determine the nature of the defect, and your item may be repaired or replaced free of charge.